B.J. Industries is pleased to present a totally new product, “The BackJack Backpack.” For the past 30 years, B.J. Industries has offered customers the most successful floor/ground seating product created. This new product from B.J. 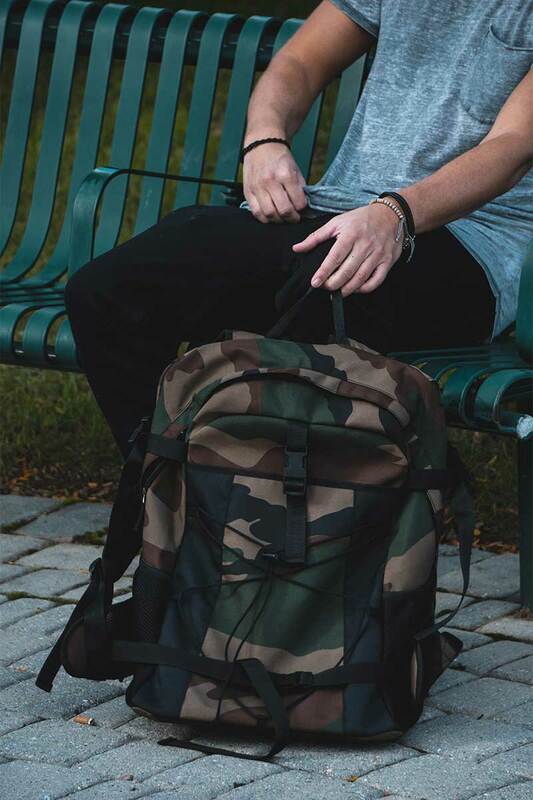 Industries combines the, “BackJack,” seat with a premium backpack. This integration offers a most functional item for all activities, school, sports, camping, hiking, or just having fun. The product is available in red/black and camouflage color schemes and folds into a compact unit for storage or transport. The chair seat when not in use provides an excellent back cushion for the backpack. The frame of the chair also allows the backpack to sit upright when placed on the floor or ground. The upright mode allows better access and care of the contents. B.J. Industries has a 30 plus year history of providing quality products and the new backpack is no exception. We offer excellent service from our Maryland production facility and can accommodate drop ship customers. The product is patented and made to the highest standards. Please contact us for more information.